I am sat at the back of Virginia George’s classroom in the Jose Manuel Garcia Rodriguez Memorial International School in Baichek, UA. “I want you to think about how you could get that heavy chest from one side of the ThinkLab™ to the other,” She tells her group of smiling sixth graders. They all know the score! Each child turns to their thinking collaborators for a quick discussion. This is not the hard part and the students know it. After a short time, they use their elbows to indicate that they are ready to contribute. A short flurry of activity follows while the children talk loudly and animatedly to each other. Virginia George doesn’t say anything at all – a key feature of this process. After a longer while than last time, the students again indicate that they are ready to contribute. Virginia George is working on a strategy that we have been developing for some time at the Extraordinary Learning Foundation™. The notion centres on ductile thinking and the need to develop ductile thinkpoints within the normal class structure. In nature, there are brittle materials that fracture easily and there are ductile materials that can be shaped to suit different purposes. The traditional approach to learning, with its emphasis on the rote memorisation of disconnected facts, promotes brittle types of thinking. 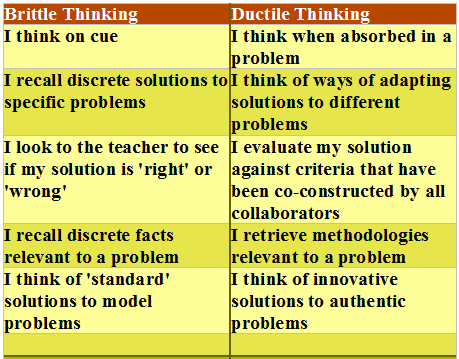 However, in order to be ready for the challenges of the 21st century, students need to develop ductile forms of thinking; durable thinking that can be shaped to fit new challenges. The careers of the future do not involve standing at a single loom for forty-years, thinking exactly the same thoughts, day after day. In fact, we don’t even know what the careers of the future will be yet because we can’t see into the future. We therefore need to prepare our students by developing their ductile thinking. In nature, you can take any brittle material and form it into a ductile material by repeatedly stretching it. This is the revolutionary concept behind the idea of introducing ductile thinkpoints. Instead of a standard teacher-student interaction where a teacher asks a low-level question, expecting the student to answer with the simple recall of a discrete fact, the technique takes the question from where the solution lands and works it back from there; like the ball in a cricket game. In fact, the magic of the approach is that it takes a solution and stretches it to suit a different problem. This is exactly the sort of exercise that will develop ductile thinking and promote transfer; the ability to solve problems in different areas based upon the same root solution strategy. This is precisely the kind of skill that businesses that don’t yet exist are demanding education to deliver right now; an education fit for not just the 21st century, but for most of the centuries beyond. I didn’t know what he meant, but I did know from Extraordinary Learning Foundation™ research that he would be able to use that solution in a wider range of contexts than 87% of European Union residents aged 21 – 57. It makes you think.